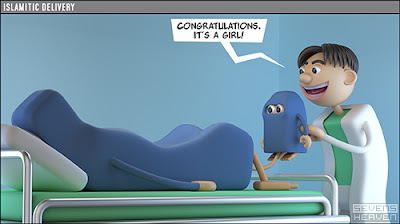 Baby burqas demanded in Mali. Oh, in Saudi Arabia too. A leaflet listing the regulations for women under Islamist rule now lies in dirt here at the tribunal in Timbuktu. Rule No. 1: The veil should cover the entire body. Rule No. 4: The veil cannot be colored. And Rule No. 8: The woman should not perfume herself after putting on the all-enveloping fabric. Several days after French special forces parachuted in and liberated this storied city, there is a growing sense of freedom. Though in the houses immediately facing the Islamic tribunal, many of the 8- and 9-year-old girls are still wearing the head covering. "It is out of fear of the Islamists that they still wear this, says Diahara Adjanga, the mother of one girl said Thursday. "They hit everyone — even children." The Islamists seized control of Timbuktu and the other northern provincial capitals of Gao and Kidal last April. During the nearly 10 months of their rule, the al-Qaida-linked extremists imposed harsh regulations for women and publicly whipped those who went in public without veils. Fatouma Traore, 21, said that there was one commander who was especially brutal to the women in Timbuktu. "We don't want the army to catch him. It's the women who want to arrest him so that we can kill him ourselves. ... Even if you're talking to your own blood brother on the stoop of your house, they hit you. Even if you are wearing the veil, and it happens to slip off, they hit you. This man, Ahmed Moussa, he made life miserable for women. Even an old grandmother if she's not covered up, he would hit her." She picks up her 1-year-old niece and hoists her on one hip, saying: "We even bought a veil for this baby." It isn't only Al Qaeda nutcases demanding a veil for babies. A Saudi cleric just declared that all female babies must have their faces covered as well. Sheikh Abdullah Daoud said on TV that even little girls must wear the veil. His logic? Since there are reports of even little girls being sexually molested, he believes that the veil will protect them! Dauod was roundly criticized on Twitter and from some fellow Saudis. Sheikh Mohammad Aljzlana, former judge at the Saudi Board of Grievances, said that the ruling was denigrating to Islam and Sharia and made Islam look bad. He added that he feels sad whenever he sees a family walking around with the children covered, saying that it is an injustice to children.